A few months ago someone sent me a link to the most delightful Shanghai food blog—Life on Nanchang Lu by Fiona Reilly. You gotta love an Australian pediatric ER doctor who decides to move to China and blog about food! 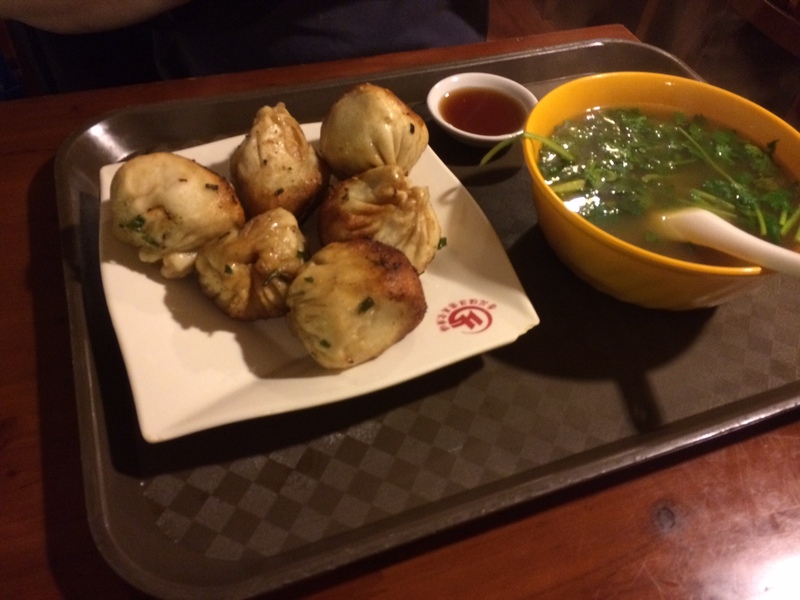 Not only is Fiona an intrepid explorer and eater, she’s a fantastic photographer, and has brought the gustatory glory of living in Shanghai fully to life. But what really hooked me was her series on Shanghai’s street food. 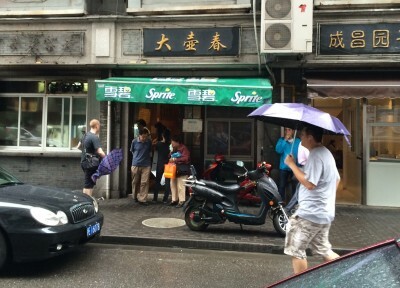 Shanghai has always been famous for its snacks, its xiao chi or ‘small eats’, whether servedin restaurants or eaten on the street. In the early 20th century, these snacks literally moved through the lanes, as peddlers pushed carts and sang brief, signature chants to alert residents to their passing. In fact these chants, which ceased to be heard sometime after the revolution, were the subject of nostalgia among elderly Shanghainese in the 1980s and 90s. When I signed my first contract with Shanghai’s textile mills in 1977, there was no street food to be found (since there was no private enterprise), and I was only able to experience the narrow range of Shanghai snacks that made it onto restaurant menus… and we’re talking stodgy old State-Owned-Enterprise restaurants. For years, I just knew I was missing something great. Then street food came back! Of course the government did try to shut it down for a while prior to the 2008 Olympics–supposedly in the name of hygiene–and temporarily relegated all street food to a designated ‘snack street’, to be sold in licensed stalls, which predictably sucked all the life out of what should be a totally fun enterprise. 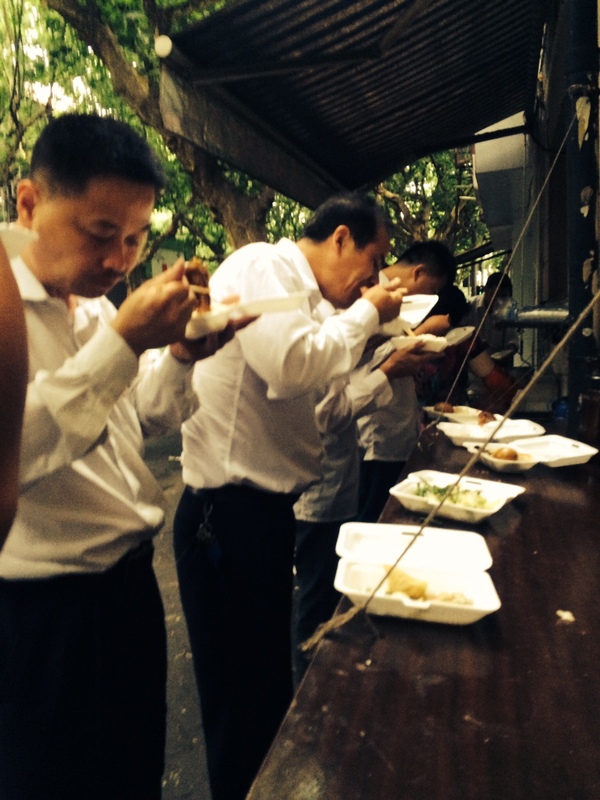 Now, I am happy to say, Shanghai’s street food has rebounded—and once Fiona Reillydiscovered it, she did the logical and reasonable thing: devoted herself to documenting it, describing it, and photographing it. My main woman! So far she has published 33(!) posts, each one enjoyably introducing and demystifying another delicious specialty of the Shanghai street. Naturally, being a medical doctor, her rules of food hygiene are always in play. 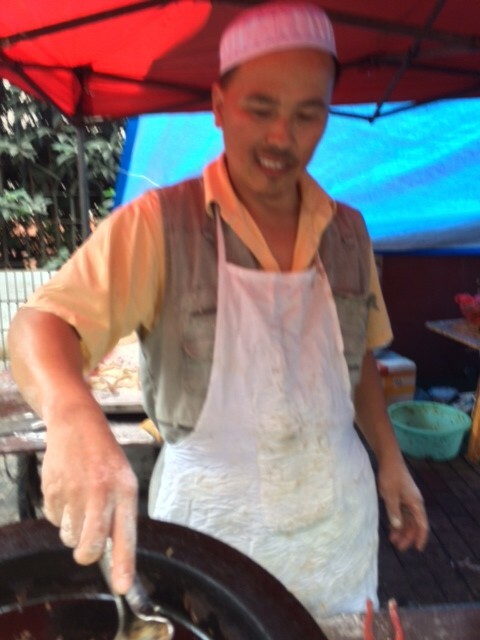 Fortunately most Shanghai street foods are freshly cooked, right in front of you, and pose little risk. When I started reading Dr. Fiona’s epic street food series with its outstanding photos, my belly rumbled in longing. So then I did the logical and reasonable thing–flew straight to Shanghai! After a wonderful week of following Fiona’s footsteps around town, I want to share it all with you, so you too can have this delightful experience when you travel there, even if you only have a few days in the city. First, bone up on the menu by going straight to the source: lifeonnanchanglu.com. It’s the best place to decide which snacks you’d most like to try, besides which, if her photos don’t make your mouth water, there’s no hope for you. Unfortunately, Fiona’s blog seems to be blocked in China (Why? What are they thinking?! ), so I urge you to look at it before you leave home. Still, the universe of Shanghai’s street food is dizzying… Fiona herself says she feels she has barely scratched the surface. Where to start? I have a few suggestions. First, consider hitting the major street food markets. The biggest one stretches in several directions from the corner of Sipailou Lu and Fangbang Lu, on the edge of the old Chinese city. Everything is sold here, from seafood vendors ready to cook you crabs and crawfish, to people selling hot pancakes or flatbreads stuffed with everything imaginable, to skewers of every description, to all kinds of noodle, hot or cold. I went with two friends, and we had a lot of fun walking the whole market before doubling back to make our choices. If you only have one window of time available to you to check out street food, go to the Sipailou street food market. 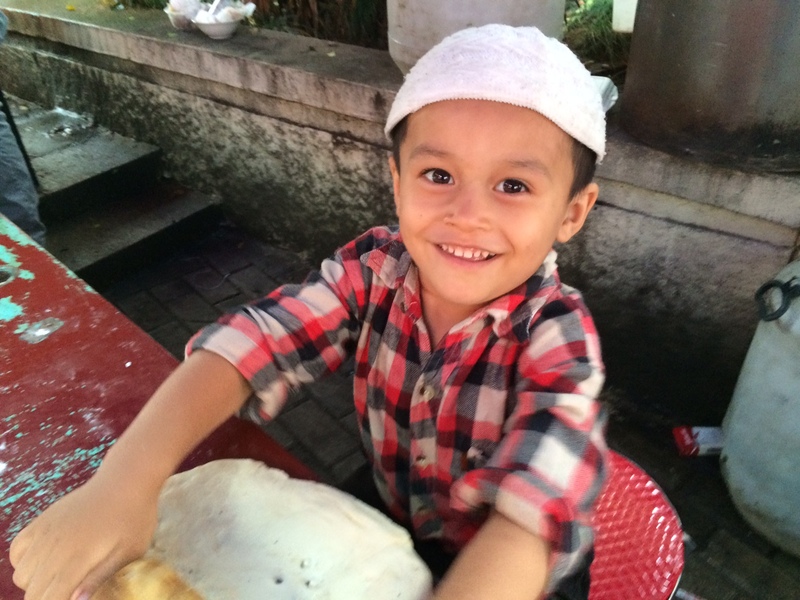 Another market that is lots of fun to explore is the Muslim street food market–and it’s only on for a few hours each week, so mark your calendar. Every Friday, on Aomen Lu at Changde Lu, at 11 AM, after weekly services at the nearby mosque, the street market fires up. You can smell the lamb roasting from a block away. 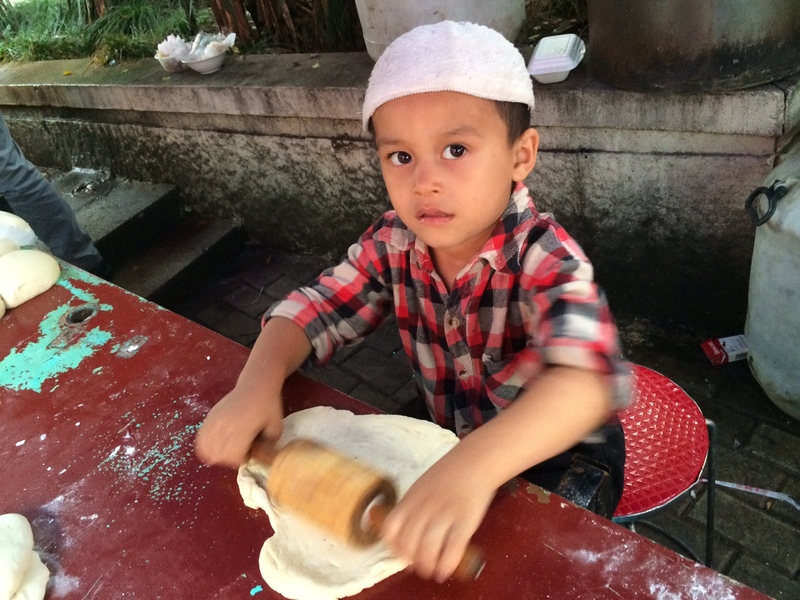 Uighurs from China’s northwestern Xinjiang Province congregate here to socialize, eat lunch, and cook their favorite specialities. One of the popular dishes is “mutton polo” or mutton pilaf, grilled lamb chunks atop rice flecked with carrots and raisins and rich with mutton fat. 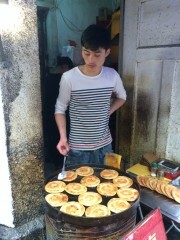 I saw a lot of Uighur men chowing down on giant lamb kebabs, minus the rice, and these looked great too. Many noodle dishes are sold, including liang pi, a hot-weather specialty of flat rice-starch noodles in a piquant sauce with a few veggies and some cooked yellow soybeans. Another interesting part of this 4-hour, once-a-week market is the display of fruits on sale from Xinjiang Province, including Hami melon (like cantaloupe but more floral in flavor), and many types of raisins I have never seen before. 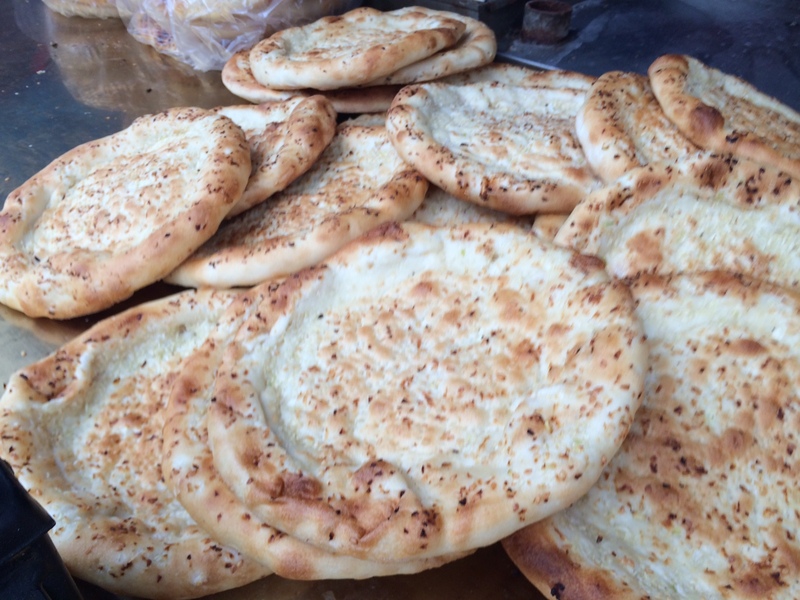 Still, if one has to pick a single standout at the Muslim market, it would be the flatbreads. Whether plain, dusted with sesame, or flecked with scallion, they are hot and delicious. Rolled out by small helpers, they are then tossed over the heads of the diners to the man who cooks. He does his magic in a beehive-shaped oven, open at the top. First he dips his hand in a bowl of water, to prevent being burned, and then quickly slips the dough in through the top, presses it to the oven wall, and snatches his hand back out. The hot, vertical wall serves as griddle. Finished product? As delectable as it looks. 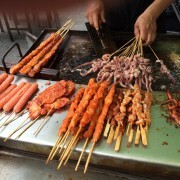 Yet many of Shanghai’s greatest street foods are found right where they belong, on the street, usually between 7 AM and 10 AM. If you go out in the morning, avoid the highrises, and walk a residential neighborhood, you will find street vendors. They are always easy to locate in the mornings by the lines of people waiting patiently to buy breakfast. Right next to my little hotel, every morning, two of my favorite snacks were being cooked to order: scallion oil pancakes (cong you bing) and folded egg pancakes (jian bing). Scallion oil pancakes are crisply fried little hockey-puck shaped cakes with a pleasingly sharp edge of green onion, savory and breakfast-friendly. 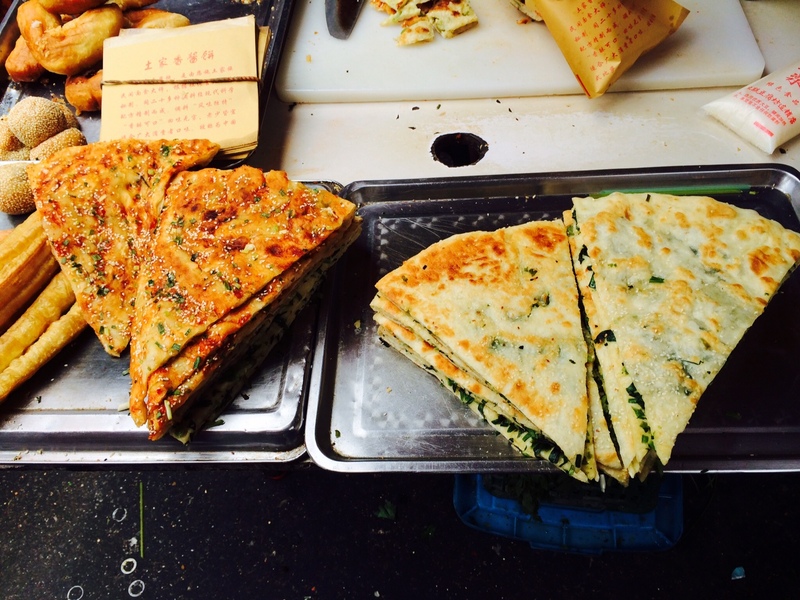 As for folded egg pancake, jian bing, it’s in a class of its own. 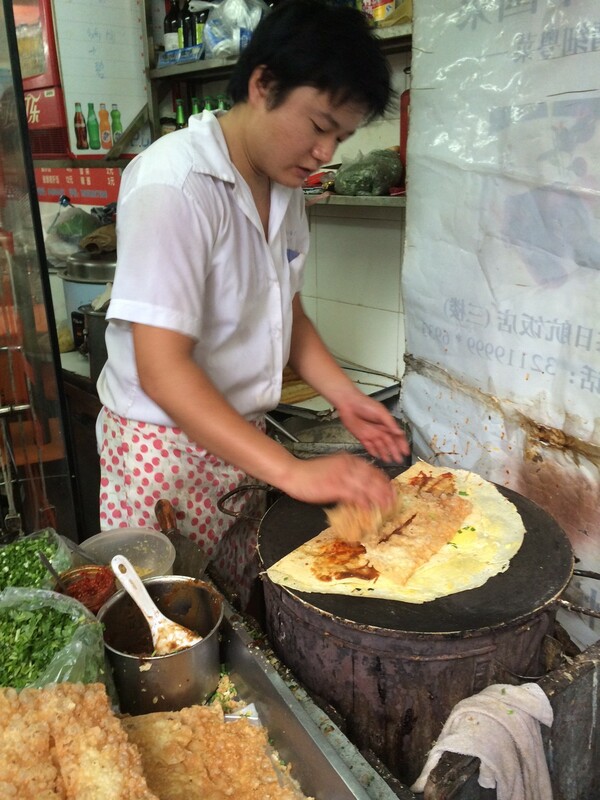 If you have traveled in China, you have surely seen jian bing being made on the street: a ladleful of mung bean batter is dropped on a large round griddle and quickly spread to the outer edges, followed by a raw egg cracked and spread the same way. As the giant, paper-thin pancake cooks, it is smeared with several sauces (Including a hot chile sauce, if you like), and spattered with green onions. Then (especially in the Shanghai version) a chopped-up you tiao, a crisply deep-fried, unsweetened cruller, is added to provide crunch. Finally the whole wondrous concoction is folded once, twice, a third time, to roughly the size of a paperback book, and then slipped into a bag for you to take on your way. All this for 3 yuan, or 48 cents. I dare you to get home with that thing still uneaten! 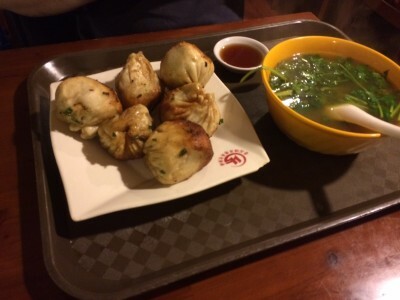 There are some Shanghai snacks which are worth a special trip to the best purveyor, and one of these is sheng jian bao, my personal favorite of all Shanghai street foods. Unlike the admittedly fabulous jian bing, which is found all over China, you can only enjoy sheng jian bao in Shanghai. This little delight of fragrant, gingery ground pork is wrapped in dough, its bottom rolled in sesame seeds, and then pan-fried until cooked through, with a crisp sesame crust on the bottom. When all the elements are in place, it’s heaven; too often, though, either the end product is too oily, or there is too much dough in relation to filling. You can always tell when a place’s sheng jian bao is going downhill by the ratio of dough to meat increasing, leading to a snack which is probably more profitable for the purveyor, but too bready to be really satisfying. I first fell in love with this local delight at the excellent restaurant Bao Luo, which makes a very good version, even if it is as big as a baseball. Thereafter, like many hungry tourists, I would usually stop by the famed hole-in-the-wall Yang’s Fry Dumpling whenever I needed a quick sheng jian bao fix. Greasy, but good. Trust Fiona to find a better place! Disappointed in the oiliness of Yang’s version, she hunted down Da Hu Chun, a hole in the wall restaurant without a real address, but very close to 61 Yunnan Nan Lu. Take a look at the photo, so you’ll be able to recognize the facade. Then go in, pay at the counter (small order, or large; there are only a few items on the entire menu here, and everyone will be getting the sheng jian bao. You can point if necessary). After paying, go back out and wait in the fast-moving line for your turn to pick up at the counter. The place has only a few tables, upstairs and down–just share a table with other diners, as everyone does. Now we get to the good part: your sheng jian bao! On the small side, perfectly crisp-bottomed yet not oily, and with a generous and delicious filling surrounded by just enough breading to contain it, no more. That’s what we’re talking about! My new favorite. Brava Fiona! 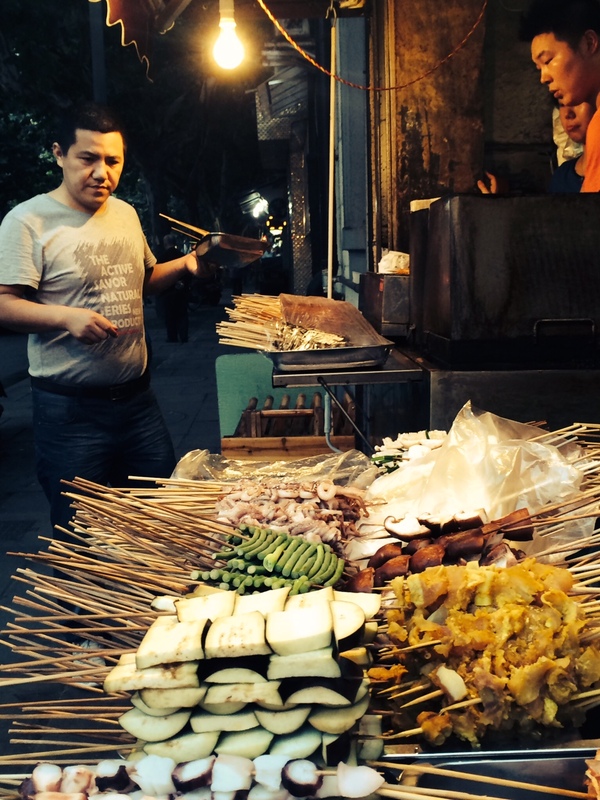 Before your trip to Shanghai, take a little time to explore Fiona’s blog, especially the street food section. It will steer you to the best of Shanghai’s xiao chi (small eats), and will add a marvelous dimension to your trip. More than a guide for the traveler, it’s also a unique and valuable ethnography of Shanghai’s urban culture. One day (if China’s modernization continues at its breakneck pace), these street snacks may be only memories, recalled with nostalgia in the same way that the city’s elders now recall the roving, chanting, street food peddlers who vanished in the 1950s. Right now though, it is thriving, and thanks to Fiona Reilly, you can experience it too.